In 2004, the first VEGF-targeting anti-angiogenic drug Avastin® was approved by the FDA for the treatment of colorectal cancer, and, today, in addition to colorectal cancer, Avastin is approved for the treatment of non-small cell lung cancer, renal cell carcinoma, the aggressive brain cancer glioblastoma multiforme (GBM) and certain types of cervical and ovarian cancers. More than 280 clinical trials are currently investigating the use of Avastin in over 50 tumor types. Dr. Dvorak’s recent research projects have led to the identification and characterization of at least six different kinds of blood vessels in tumors. While current anti-angiogenic therapies primarily act against only one of them, his research group has already discovered new therapeutic targets on the other five vessel types. They are aiming to improve the effectiveness of anti-angiogenic therapy by attacking the entire tumor environment, providing opportunities for new types of anti-cancer treatments. Harold F. Dvorak, M.D. attended Princeton University and Harvard Medical School. He started his career with residency training in pathology at Massachusetts General Hospital (MGH) and spent two years as a post-doctorate at the National Institutes of Health. Dr. Dvorak worked as a staff pathologist at MGH for 16 years and then spent almost 30 years at Beth Israel Deaconess Medical Center. Dr. Dvorak served on the faculty of Harvard Medical School starting in 1967 and, throughout his career, was a visiting professor at numerous national and international scientific conferences. In addition to his long-running fellowship with NFCR, he was a fellow of the American Association for the Advancement of Science and served as President of the American Society for Investigative Pathology. 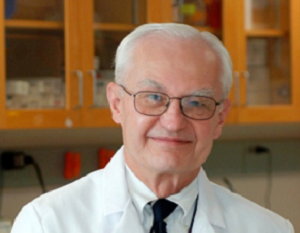 Dr. Dvorak was the first winner of NFCR’s Szent-Györgyi Prize for Progress in Cancer Research in 2006 for his discovery of VEGF. He also won the 2002 Rous-Whipple award from the American Society for Investigative Pathology and the 2005 Grand Prix Lefoulon-Delalande from the Institut de France. Your ticket for the: Harold F. Dvorak, M.D.